In order to bring you ease and practicality in accessing the Panasonic Lumix DMC-FX550 Manual writing, here we enclose the Table of Content for this article. With this Table of Content, you can get into the certain part of this writing simply by clicking on the sub topic below. It’s been generally known that a manual is something important as a product complement, especially for electronic product such as digital camera. With this manual, users will be so much helped in understanding the product. It is due to the rich information that the manual has. And from this information, it will be possible for user to understand the specification, operation, camera parts, and other related information. This is the reason behind our decision in bringing Panasonic Lumix DMC-FX550 Manual here. With this manual, we hope that we can help you in learning this camera product. Before getting down directly to the Panasonic Lumix DMC-FX550 Manual, now we are going to talk about the specification of this camera product first. And to begin with, here is the overall look of this camera. In United States, this camera is also known as Panasonic DMC-FX58. With this series, Panasonic continues to impress their users with sophisticated camera product. In 2008, they released their first ever compact camera that has a touch screen interface, the FX500. It was very popular among compact camera users because you can actually control the image through its screen. And now, they want to continue the legacy of touchscreen compact camera series. This Panasonic DMC-FX550 is the perfect camera for you who want a robustly built small camera. It will definitely be perfect to pack with the other gear for your summer Holiday this year. Even though this cool camera has touchscreen interface, it still provides the standard cursor key control. The boxy and traditional design makes this DMC-FX550 at its best. You can choose the color of this camera between black and silver. It is not actually a silver color, but, it is what we called a pseudo-brushed aluminum. Unfortunately, it is not available in Pink color, so it will be a disappointment for Ladies. About size, the size of this camera is small and thin, so you can easily slip it into your bag or pocket. A nice 3inch LCD with touchscreen feature, fulfill the amazing experience with this camera. The semi-retro look in this camera looks pretty simple and elegant. Talking about specification, the Panasonic Lumix DMC-FX550 Manual will be the best source if you want more detail information. But, if you want something simpler, the explanation below can be the good choice to take. 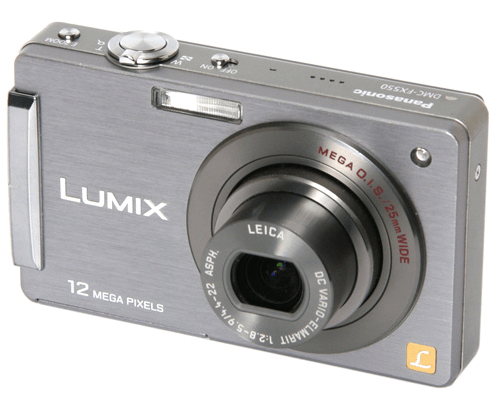 For your information, the lens that is used in this cool compact camera is 12.1mp in resolution. And talking about video recording, with this DMC-FX550 camera, you can record a video in High Definition. You can even replay it in QuickTime software on your desktop. The resolution is in 1920×1080 pixels. The frame rate of 30fps is still the same as the previous one, FX500. Talking about duration, you can record the video as long as you want, but it depends on the memory card’s space. For the manufacturer information, Panasonic, visit this wiki page. From the information taken in Panasonic Lumix DMC-FX550 Manual, the top feature in this camera is its touch-screen LCD. It is easy to use; you can just tap it away with your fingers. Some people reviewed this DMC-FX550 as an excellent little compact. The simple design gets this camera to be easily functioned. The autofocus that might be a little slack is not going to drag the greatness of this camera down. This camera is also recommended by many people and website reviewers. And if you are comfortable with manual controls in a compact camera, this camera is for you. You can buy this camera from the store for about 250 pounds. It is already stated before that the purpose if this article is to provide Panasonic Lumix DMC-FX550 Manual. With this manual, we hope that we can help user in understanding this camera product better, so at the end they could operate as well as treat the camera better too. But, one thing to be noted before accessing the Panasonic Lumix DMC-FX550 manual is that this manual will be provided in PDF file format. So, it will be better if you have PDF reader software installed in your device before you downloading the manual. We guess that’s all of the information that we need to share you regarding to the Panasonic Lumix DMC-FX550 Manual. We hope this information could be valuable for you as user or enthusiast. Further, if you still have any other idea or opinion toward this product, it will be so contributive if you put them in the comment session below. And lastly, if you think that this information is informative, sharing it in your personal page will be so much appreciated.